The funds remain deposited in the firm and are productive interests; each workman receives a booklet which reports to him, at the time of accounting, the share of the benefits in which he is vested. In order to make sure the workmen do not waste the savings accumulated for their benefit, the rules stipulate that the shares are nontransferable and nondistrainable and that participants can touch their share of the capital only when they leave employment with the firm. The only exception to this rule is for workers who want to acquire a house. Mr. Pernod agreed to that, figuring that settling on real estate is a guarantee against the temptation to waste money to which workmen in possession of movable capital easily succumb. At the end of each year, all participants are vested in the interest accrued to them that year. The benefit shares increase with years of service for a period of six years, after which they reach their maximum rate which was in 1894 40% of wages; the minimum rate was 10%. The retirement fund had grown as of December 31st, 1894 to 267,566.25 francs. Retiring workmen and heirs to deceased workmen have, since the foundation of the retirement fund, withdrawn the sum of 238,705.25 francs. We have before us (December 1894) the account booklet of a worker who has participated in the plan since 1871, and whose share has accumulated with interest to a total of 11,351.70 francs. The firm insures its workmen against accidents; it even pays the premiums itself without making the workmen pay into the pool. The effective working day is fixed at 11 hours; the minimum wage is 20 centimes per hour for women and 30 centimes per hour for men. Work is suspended all day on Sunday. No effort is spared to improve working conditions and to avoid accidents.Two collections are taken each day for personnel to also have the benefit of Christmas gifts at the end of the year. Every summer an excursion open to all personnel is organized at the expense of the firm to an interesting town or to some picturesque site. 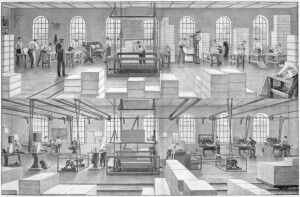 A band recruited almost exclusively from among the workmen of the establishment brightens these outings and contributes at all times to the esprit de corps which is in any case very strong; the workers of the Pernod factory regard themselves as privileged to belong to a firm which assures them of such benefits. Therefore recruitment could not be easier; applications are always numerous and the firm suffers only the embarrassment of having to choose from among the crowds of candidates who show up. There have never been strikes in the House of Pernod and Sons. Commonality of interest has rendered the rapport between owners and workers cordial and easy. Time and time again, without any false modesty, the workmen have seized the opportunity to express to their bosses their appreciation for the good policies of which they are the object.